The Genealogue: Could McCain Lose the McCain Vote? Could McCain Lose the McCain Vote? 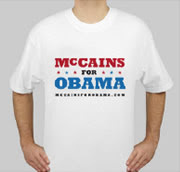 McCains for Obama share the surname, but not the political views, of the Republican nominee. Sure, old Mac’s got a fantastic last name. True, he’s acknowledged that global warming exists and torture is mean. And yes, he can take six men to the ground using only a shoe horn and length of dental tape. But as much as we’d love to share a surname with the most powerful man in the World, these things hardly qualify John McCain to pull this country out of our eight-year catastrophest and into a brighter, healthier, more peaceful tomorrow. So unite, McCains of the world! Because while we clearly have the superior last name, Obama’s no doubt the man for the job. In contrast, Barack has locked up the Obama vote—with the exception, perhaps, of Hillary C. Obama of Cleveland. Oh no, you're deleting me? Please accept my apology, and allow me to remove from this blog any words that might offend you. On second thought, I think I'll just keep writing whatever I want on my website (which by the way, is called The Genealogue). Thanks Chris for not being bullied by M.hart1. I am an Obama supporter but I didn't even think your post was partisan - if you had posted about the Washington Post article, A Family Tree Rooted In American Soil on Michelle Obama's slave ancestry would that have also been partisan ? Thanks, Nancy! I would call the post "topical" rather than "political." Here's a link to the Michelle Obama story you mentioned.